What’s different about the maps? Ultimately, any time spent in becoming familiar with Ordnance Survey maps is time well spent, but the learning process can have it’s frustrations, especially if there is nobody on hand to consult. The maps used here are designed to overcome at least some of those frustrations by including extra detail where it may help and leaving out detail where it may only confuse. Hopefully, after nine days out with these maps, you will be confident enough to take off with an OS map and to devise new routes for yourself. There are a few major differences from regular maps. The Sections If you enlarge the map on the right, you will see that it is divided up into four sections. You will always be walking from the bottom to the top - no more turning the map in your hand trying to read upside-down writing and worrying where north is. It doesn’t really matter where north is (having said that, there is a symbol for each section to tell you where it is) because this isn’t the kind of country that requires compass-work. You start at the beginning of section 1 (all sections start at the numbered green arrow), walk to the red arrow, then return to the next green arrow at the bottom of the next section and repeat. When there are no more arrows, you should be seeing your car - if you reached the start by bus, well done you but you probably won’t be getting your ride back for a week. The Times At various points along the way you will see a set of numbers (01:23:55) in orange. These are times which correspond to the slow video (not the fast video). They may be at points where the choice of where to go next is confusing, or at natural break points (you know - coffee, snack, natural break). 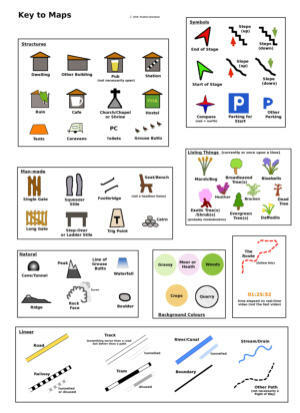 They are also a useful guide as to how far through the walk you are, since there are no references to distance. The Distances You may have noticed some vagueness about the length of the routes (use of “approx” on the maps, etc.). You can get a better idea of how long/short and easy/hard they are from the times and videos. If you want to have a number of miles/km to impress friends with, take the one on the map and add 25% - that’s what everyone else does. What’s that you say? You think they might check up on you? Are those really friends?. Contours There aren’t any. Assume there will be slopes - some up, some down. If and when you arrive back at the start, the two will have exactly balanced out. Tell yourself this on the steepest parts. Only the steepest parts are indicated, along with any steps. The video will tell you more. Key The maps contain many different symbols. A key to what they represent can be downloaded (.pdf) here. Files When you download the maps, they will be in a zipped folder. 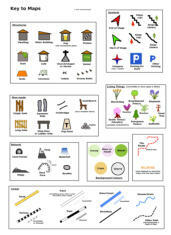 Unzip this and you will have the pages (A4 size) of the map, in both .pdf and .jpg form. There is no difference other than the file type. Other Maps Having attempted to convince you that these guides give you all the necessary information in order to complete a walk, we would still urge you to buy the appropriate OS map. They are wonderful works produced by wonderful people. And remember - by buying just one OS map, you are helping to feed a hungry cartographer for most of a morning. The Start A green arrow and a 1 indicate the start of the walk Parking will be a public car park, lay-by, or roadside and, wherever possible, free. End of Section The red arrow is the end of the section. Move on to the next green arrow, which is pointing to the same place, although it may not appear so because the map is rotated. And so on…………..to the end. North South East West If you really want to know where North is this will tell you. The red needle is pointing the way. Stiles and Gates Every time you have to cross a wall, fence or other barrier, by means of a stile or gate, this will be indicated by one or more of these symbols. Some of the walls can be high - not easy with a large and lively dog draped around your neck. If in doubt, check the video. Or get a scarf. Time This is the time (hrs:mins:secs) on the slow video when you will be at this point. Buildings Buildings are included to help with navigation. There are more houses than this in Upper Ellastone They are not all exactly the same size. They do have windows. The Right Way The red line is the one to follow. It follows Public Rights-of-Way or crosses Access Land. Other paths are indicated to assist with navigation. Don’t assume you have the right to use them. You will always be walking from bottom to top - no more turning the maps in your hand whilst trying to read upside-down writing and wondering where north is. It doesn’t really matter where north is (although there is a symbol on each section to tell you), because this isn’t the kind of country that requires compass- work. You start at the beginning of section 1 (all sections begin at a numbered green arrow), walk up to the red arrow, then return to the next green arrow at the bottom of the next section and repeat. When there are no more arrows, you should be seeing your car - if you reached the start by bus, well done you but you probably won’t be getting your ride back for a week. On screen or paper, no more rotating needed. The Times At various points you will see a set of numbers (01:24:54) in orange. These are times which correspond to the slow (not the fast) video. They may be at points where the choice of where to go next is confusing, or at natural break points. 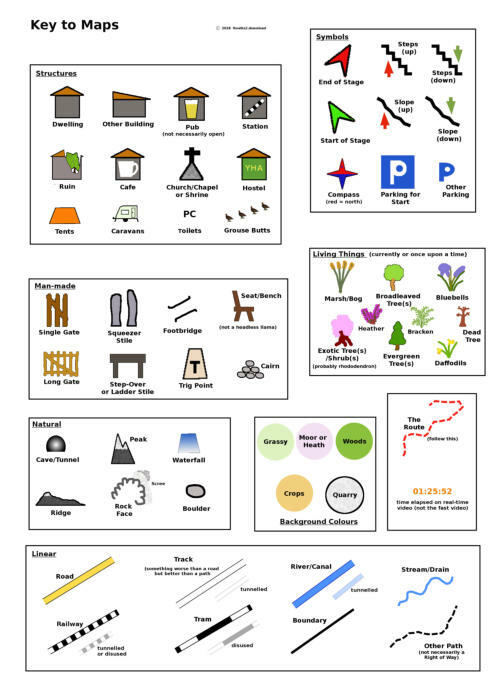 They are also a handy guide as to how far through the walk you are, since there are no references to distance. The Distances You may have noticed some vagueness about the length of the routes (use of “approx” on the maps, etc.). You can get a better idea of how long/short and easy/hard they are from the times and the videos. If you want to have a number of miles/km to impress friends with, take the one on the map and add 25% - that’s what everyone else does. What’s that you say? You think they might check up on you? Are those really friends? Contours There aren’t any. Assume there will be slopes - some up, some down. If and when you arrive back at the start, the two will have exactly balanced out. Tell yourself this on the steepest parts. Only the steepest parts are indicated, along with any steps. The video will tell you more. The maps contain many symbols. A key to what they represent can be downloaded as a .pdf here: Files When you download the maps, they will be in a zipped folder. 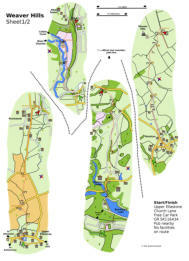 Unzip this and you will have the pages (A4 size) of the map, in both .jpg and .pdf form. There is no difference other than the file type. Other Maps Having attempted to convince you that our guides give you all the necessary information in order to complete a walk, we would still urge you to buy the appropriate OS map. They are wonderful works produced by wonderful people. And remember - by buying just one OS map, you are helping to feed a hungry cartographer for most of a morning.